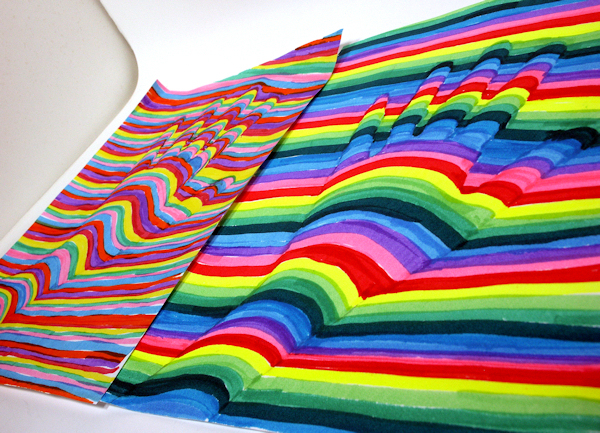 Fun OP-Art Project for Kids! You will need: A ruler, markers, a pencil and a piece of typing paper. Here is what you do, trace a shape on the typing paper using a pencil. 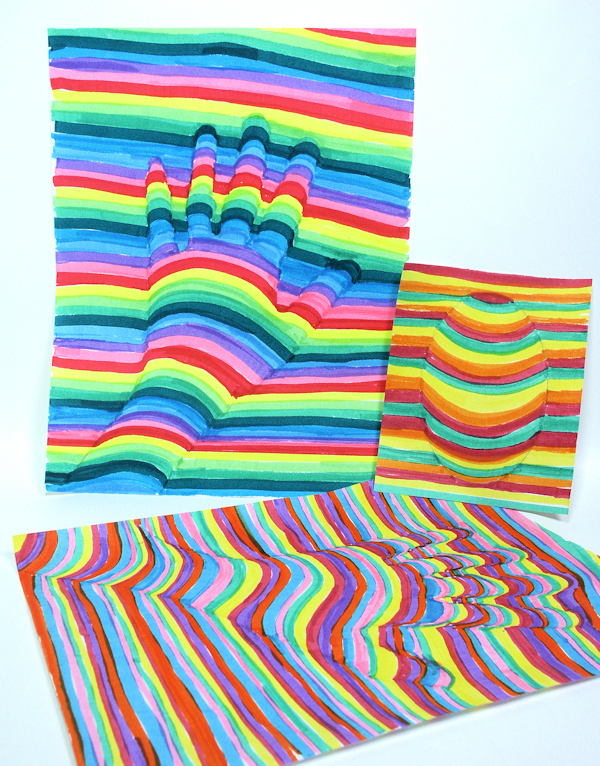 You can trace your hand (now that’s handy!) or a dish, stencil or anything you can find, simple shapes are best though! Then use a ruler and a marker to make a line across your paper parallel to the bottom of your paper. Draw the line up to the edge of your shape but don’t draw through the shape, then draw from the other side of the shape to the other edge of the paper. You have a gap in the marker line in the middle of the shape. Draw an arched line (like a rainbow) within the shape connecting the first 2 lines you made. Now using this line as a guide fill in the paper with stripes in the same manner. This will take a while, your eyes might cross and I had to take an aspirin when I was done because my head was spinning a bit. But the big payoff is when you lay the paper on the table flat and look at it from a distance, it looks like the shape is raised off the paper. Cool! One of my daughters said it looked like the hand was under a blanket. The paper is flat but we created an illusion, a-la-peanut-better-sandwich! You are a crafty magician! Have fun with this project and til next time happy crafting! Now that looks fun! Thank you! What a fabulous fun project! I love it! You are one cool mom. When I was a kid–back in the dark ages when art was still routine school curriculum along with music appreciation and Civics– I loved to finger paint. When I got grade school and was ‘forced’ to color in the lines, my creativity was stifled and I ended up a perfectionist. THIS project makes me want to play again!! LOVE it and may just try it for the heck of it. My babies are older than you and I have no grands so it’s the only way I’ll a chance to do it. ALSO–if you haven’t done already, I’m really interested in diorama cards. I’ve made a couple using a SCS tutorial, but I’d love to see your take on them–especially some fall/Halloween/Christmas ones. PS–I subscribed to your youtube channel a long time ago but my username is different there (I’m cathy615). I watch ALL your vids. You are my go to person for crafty inspiration. Looks like a fun project but my head was swimming just looking at it! Would love to watch you on a video do this Lindsay….what a kick! Looks like a fun project to be sure! What a cool project, thanks for sharing!! Now I’m going to play with this technique! Thank you for saving my 5th grade art day … again!! !